Port Adelaide football club captain Warren Tredrea only spent 24 hours holidaying with friends in a river shack before he became addicted to the lifestyle. Along with wife Rachael, the couple spent a day with friends at Walker's Flat in their holiday shack. "We went up there for a day and it felt like a three week holiday," Warren said. "It was after pre-season training and just before the season began and it felt just great." 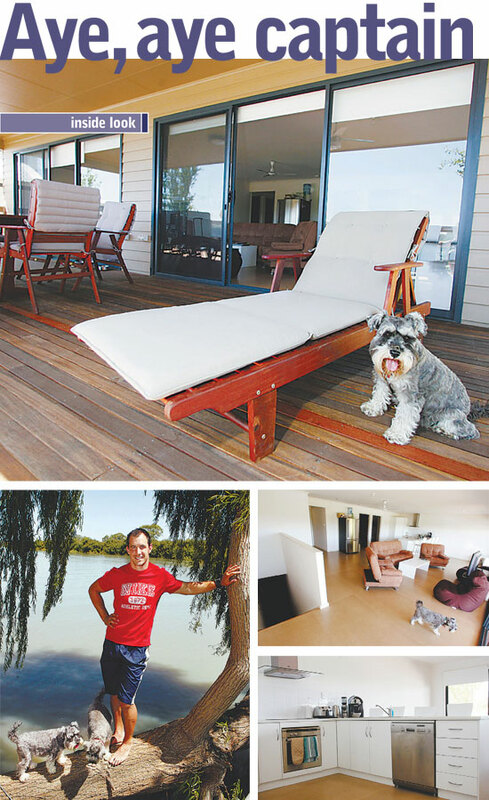 Within two years he had purchased a block of land on the Murray, successfully sat for his boat licence, bought a boat, found a builder, chose his design and built his home. "After that time in Walker's Flat I just thought that's what I want to do," he said. "Looking towards the future when we have children, it will be a better lifestyle for them. "I'm lucky enough to be playing football which pays reasonably well for a short time. So it was a matter of do it now or don't do it at all." Rachael had previously built a house with Sarah Homes so they went to the company for design ideas. "Basically we chose a two storey design which needed a few modifications to fit the narrow block we have," Warren said. "They were really great with accommodating what we wanted and we are delighted with the final result. We needed an elevated two storey so we could accommodate a boat." A feature of the home is a large 9m x 5m wooden slat decking on the second storey. It overlooks their small front yard and the Murray which laps at their property any time a boat passes. Two sliding glass doors lead into the single storey living area which houses the lounge. The modern kitchen has stainless steel appliances, corner pantry and laminate benchtops which double as the meals area. Guest bedrooms with a double bed and another bunk bed lead off this area. A small hallway leads past the bathroom and toilet to the main bedroom at the back of the second storey. A stairway leads downstairs to another bedroom, laundry and bathroom. "I think it's important to have somewhere to slow down and relax - do nothing if you want," he said. The house was completed the day before Christmas - Warren's birthday - just in time to have friends over. "Every time I'm up here it's like a holiday. It takes me about 10 minutes to sit down and relax. It's great to have friends over and the barbecue seems to operate non-stop since we have moved in." For more information about the house in this story please look at the McCubbin 3.